Clashes between Kurdish and Iranian-backed Shiite paramilitary forces including Turkmen groups broke out late on Saturday in northern Iraq, killing at least nine people and cutting a strategic road between Baghdad and the oil city of Kirkuk, security and medical sources said. Violence in Tuz Khurmatu, about 175 km north of the capital, has become a near monthly occurrence between the armed groups, uncomfortable allies against Daesh since driving the militants out of towns and villages in the area in 2014. A small explosion just before midnight near the local headquarters of two rival political parties sparked armed exchanges between the communities that spread to most neighborhoods and continued into Sunday morning, according to security sources. Fighters launched mortars into densely populated areas and fired rocket-propelled grenades and heavy machine guns at the opposing positions. Unverified photos published by a Shiite militia group showed flames engulfing a tank on a main road and heavy black smoke rising from a residential area. The clashes between the peshmerga and the Shiite Turkmen group, who belong to a militia umbrella organization known as the Hashed al-Shaabi, began around midnight and continued into Sunday, officials said. Karim Shukur, an official from the Patriotic Union of Kurdistan party, said the trouble began when a member of the Hashed al-Shaabi threw a grenade at one of its headquarters in Tuz Khurmatu, wounding peshmerga fighters. The Hashed al-Shaabi meanwhile blamed the Kurds for the unrest, saying in a statement that the clashes started after Kurdish forces targeted one of their headquarters in the town. 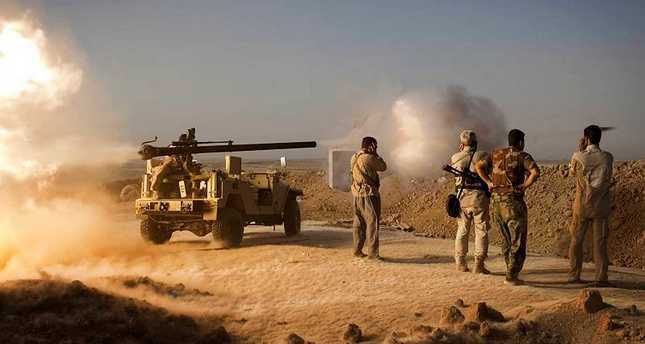 Seven Shiite fighters and three members of the Kurdish peshmerga forces, including a senior commander, were killed and at least two civilians, including a child, were wounded, security and hospital sources said. The death toll was expected to rise since snipers were preventing people from transporting casualties to hospital. The tensions risk further fragmenting Iraq, a major OPEC oil exporter, as it struggles to contain DAESH, the biggest security threat since a U.S.-led invasion toppled autocrat Saddam Hussein in 2003. Efforts to push back the militants have been complicated by sectarian and ethnic rivalries, including a contest for territory which the Shiite-led government in Baghdad claims, but the Kurds want as part of their autonomous region in the north of the country. High-level delegations from both sides arrived in Tuz Khurmatu on Sunday to try to solve the latest dispute as military reinforcements were said to be gathering outside the district. The fighting last November began as a dispute at a checkpoint that escalated into clashes inside Tuz Khurmatu. Dozens of homes were burned, and the town has been split between Kurdish and Shiite areas, with neighborhood minority residents moving back across the ethnic divide. Meanwhile, suicide attacks targeting security forces in two Baghdad suburbs have killed at least 14 people and wounded dozens, officials said Sunday. A suicide car bomb struck a checkpoint in the eastern suburb of Hussainiyah late Saturday, killing six civilians and four soldiers, a police officer said. He added that another 28 people were wounded in the attack. DAESH claimed the attack in a statement posted on a militant website.